German food in warm weather seems like an oxymoron. But the more you know about German food, the less this seems so. Yes, the Germans need not contend with the sort of apocalyptic summers you might endure in, say, Phoenix or Bakersfield, but it does get kinda-sorta hot up there, and they do have dishes for when that happens. Anyone who reads this site with any regularity knows how much as I love meatballs in all their forms. And I love fish balls just as much. 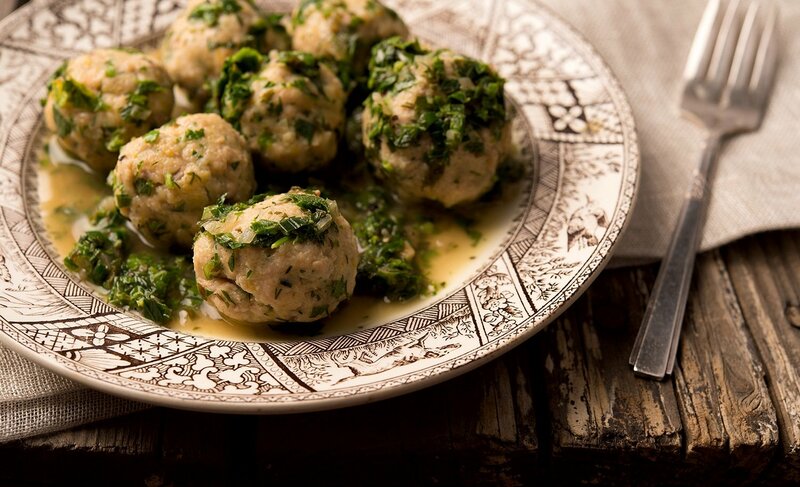 My Laotian style fish balls are a favorite, and my Sicilian tuna meatballs are so good you’d be hard pressed to tell them apart from a properly made meatball made of pork and veal. So why not do a German one? I got the inspiration from the always inspirational Mimi Sheraton’s The German Cookbook: A Complete Guide to Mastering Authentic German Cooking. This is not a direct adaptation from anything in her book, but if you are even remotely interested in German cooking beyond schnitzel and sauerbraten, you need this book. 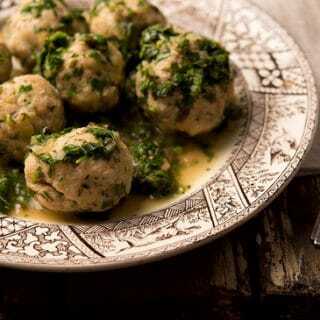 The fish meatballs could not be simpler: Ground fish (of any type), mixed with egg, breadcrumbs and herbs. Poached very gently in salty water, they come out light and fluffy. The green sauce adds several layers of flavor round things out. You should know that this is not a traditional Hessian green sauce. That sauce has crushed up hard-boiled eggs in it, or sometimes mayonnaise. My version is lighter, and much better for the kind of hot days we get here in Sacramento. But I really like the German tradition of using lots of different herbs to make the sauce, so I kept that in my rendition. It is a lovely, light supper. The fish is moist and almost bouncy, the sauce an equal combination of buttery goodness, tangy creaminess from the sour cream, and a rat-a-tat jolt of the various bitter-sweet-aromatic herbs as you taste each one. As a main course, I’d serve this with new potatoes or bread. But it’d be fantastic alone as a summertime appetizer. Keep in mind that pretty much any fish will work. The Germans do this a lot with freshwater fish like pike, perch and the like, but I made this version with trout. I think literally any fish you can get a fillet off of will work here, down to about herring. Walleye, trout, bass, perch, striped bass, flounder, small redfish, etc — it’s pretty versatile. So is the sauce. Feel free to mix and match herbs to your liking. Other good candidates for the sauce would be tarragon, thyme, cilantro (although not very German), radish or turnip greens, watercress, basil, borage, New Zealand spinach… you get the point. This is a surprisingly quick dish to put together, once you know what you're doing. If you have a meat grinder, the meatballs come together in a flash (If you don't have a meat grinder, pulse fish fillets in a food processor, or chop finely with a knife), and the sauce really doesn't take more than a few minutes to make. And if you pre-grind the fish and keep it in the fridge, you could easily whip this up in less than 30 minutes. To make the meatballs, simply mix all the ingredients in a bowl and form into small meatballs, about the size of a walnut. To cook, bring a large pot of salty water to a boil and gently lower the fish balls one at a time into the water. They will sink. Turn the heat down to a bare simmer -- if you let it boil again, it can destroy your fish balls. Simmer gently until the meatballs float. Look for a total cooking time of about 10 minutes or so. Remove the fish balls from the hot water and set aside. While you are heating up the poaching water, make the green sauce. Heat the butter in a large saute pan over medium-high heat. When it's hot, add the shallot and saute until it's translucent and soft, about 3 minutes or so. Don't let them brown. Add the stock and bring to a boil. Boil hard for a few minutes until the sauce reduces by about one-third. Turn the heat as low as it will go and stir in all the herbs. Let them all wilt. Add salt and black pepper to taste and turn the heat off. When all the fish balls are ready, turn the heat back onto the sauce to warm it, and coat the fish balls with the sauce. When the sauce boils again, turn off the heat, let the bubbling subside and add the sour cream, stirring constantly. Adjust for salt and black pepper once more and serve at once. Steven: I am sure it would – just use the white meat, not the dark “blood line.” Good use for a bony fish like that, too. This has been on my “too cook” list for a while. It was fantastic! If you are a fan of German flavors this is spectacular. But I think that there is a lot more to this recipe. The basic process can be used with a lot of different herbs to create a huge amount of regionally inspired dishes. As it stands, this dish is fantastic. It’s perfect for panfish, or in my case the lower (rib) portion of walleye fillets after I zipper them. Thanks Hank, another winner! I made this dish and absolutely love it with Salmon! I love anything German! 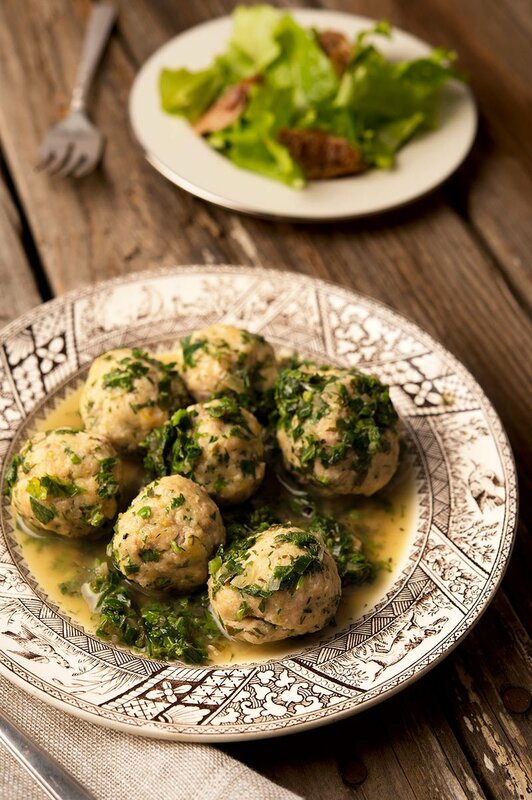 What is this dish called in Germany?